Have you ever gone to Target for one item and you end up leaving with a whole cart-full of goodies? My guess is that we can all relate to that! On my last Target trip I found some new, favorite hair care products that have been rocking my world, and they have given my pricy, salon picks a run for their money. I wanted to share my favorite items, and the awesome thing is that a majority of the items will not break the break (completely). I am a sucker for quality hair products that actually work, and although I am always trying new products, I have found some that will likely stick around for a while in my arsenal. All I have to say is…obsessed. I am obsessed with this line for many reasons. I purchased a majority of the line (including the purple shampoo and conditioner for blondes), and not only does the formulation jive with my hair, but the smell is unbelievable. The price point is totally do-able, and all full size products range $10-$14 at Target. After washing, my locks are so darn soft, and easy to style or air dry. I hope this line sticks around because I am going to stick with these products for the long-haul. The dry shampoo is also awesome and the scent will turn around any second (or third) day hairstyles. Final note for my fellow blondes: the purple shampoo and condition is probably one of the best ones out there…and I have tried them all. If you are willing to spend a bit more for some salon picks, you can see my favorites above. 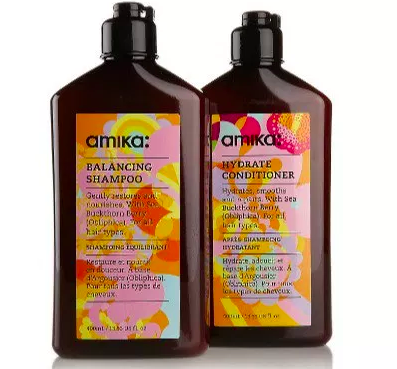 I have been using Amika products for a while and the fragrance is delightful! When I add a wave to my hair, I always use the IGK Beach Club spray to add texture and hold my waves. Prior to blow drying my hair, I spritz in the Pureology 21 spray. It helps protect my strands from heat styling and it detangles perfectly. My hairstylist turned me on to both the IGK and Pureology products and they make styling a breeze (thanks, AmyJo). What are some of your favorite hair products and what makes them amazing?